Welcome to our third issue of The eBullet for 2009. As the economy settles down a little from its recent agitation, more folks than ever seem to be embracing simplicity and gentler times in their lives. As fans of Mayberry, we've never stopped appreciating those values, which go hand in hand with the superb entertainment we enjoy with TAGS. Mayberry has as much to offer us now as it ever has. As TAGS heads toward its 50th Anniversary in 2010, there are some exciting things in the works for everyone who loves TAGS. Here are some of the fun events coming up in the world of Mayberry during the rest of this year. * Now-June 28: Ronnie Schell stars in Don't Leave It All to the Children--The Musical at the Actors' Temple Theatre, 339 West 47th Street in New York City. Cast of Don't Leave It All to the Children (top to bottom): Steve Rossi, Marcia Rodd, Ronnie Shell and Barbara Minkus. Performance times are 3 p.m. on Wed., Sat. and Sun., and 8 p.m. on Sat. Visit http://www.telecharge.com for tickets and more info. * July 4: David Browning brings a Mayberry pace to the Summer Motion Festival in Ashland, Ky.
* July 8-12: Ronnie Schell headlines at Budd Friedman's Comedy Improv Room at Harvey's Hotel in Lake Tahoe, Nev.
* July 11: James Best is the Special Guest and Grand Marshal for the 9th Annual Mayberry Squad Car Nationals and 5th Annual "Mayberry Comes to Graysville" Festival in Graysville, Ala. 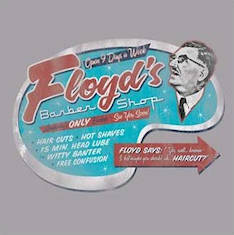 Bunches of Mayberry tribute artists will also be on hand. The exact schedule for the day hasn't been announced but usual schedule is the parade down Main Street around 9 a.m., the Mayberrry Squad Car Nationals on the ball field at the Graysville Community Center around 11 a.m., afternoon entertainment, and then dinner and entertainment in the evening. And it's always very reasonably priced, including free admission to the parade and the Mayberry Squad Car Nationals parts of the day. We'll have updates on the Event Calendar at iMayberry.com as more details are announced. * July 18 and 19: Smoky Mountain Fan Fest featuring James Best and other members of the "Dukes of Hazzard" cast, at Smokies Stadium in Sevierville, Tenn. Butch Patrick (Eddie Munster on "The Munsters") and Margaret Pellegrini (one of the last Munchkins from The Wizard of Oz) also appear. Merle Haggard and Janie Fricke perform in concert. Tickets are on sale now at (865) 286-2300, with info also at http://www.smokymtnfanfest.com/. * July 22: David Browning will be a pinch hit at the South Maryland Blue Crabs game in Waldorf, Md. * July 24: It'll be darn good time with David Browning at the Salem (Va.) Red Sox game. * Aug.6: David Browning takes a bow and wows the crowd at the Bark in the Park Festival in Bristol, Va.
* Aug. 2: Fundraiser concert for VW Boys band member Larry McPeak in Troy, N.C. (Larry needs a kidney transplant.) The VW Boys, the Lonesome River Band, and Mayberry tribute artists are among the performers announced so far. More details to come. * Aug. 8: Maggie Peterson joins two of her TV brothers, Doug Dillard and Rodney Dillard, and their band for a performance at the Third Annual Mayberry in Troy, a fundraiser for the Montgomery County DARE program in Troy, N.C. Several Mayberry tribute artists will be on hand, too. More details TBA. * Aug. 14: David Browning will tell a few Mayberry yarns at the Bristol (Va.) White Sox game. * Aug. 22: If you have the courage, go see David Browning at the Danville (Va.) Braves game. * Aug. 27-29: James Best is among the stars at the Mid-Atlantic Nostalgia Convention in Aberdeen, Md. For more info, visit http://oldtimeradiotapes.homestead.com/conventionhome.html. * Aug. 29: One of our faves (you know who!) gets raves when he patrols the Mississippi Braves game in Pearl, Miss. * Sept. 5: It'll be one big happy family in the community of Crossville (Tenn.) when David Browning entertains at Community Family Day. 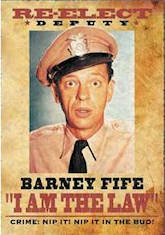 * Sept. 24-27: 20th Annual Mayberry Days in Mount Airy, N.C. Guests confirmed so far include Doug Dillard, Rodney Dillard, Maggie Peterson, Betty Lynn, James Best, LeRoy McNees, Jackie Joseph, George Spence, and Karen Knotts, daughter of Don Knotts, in her Mayberry Days debut. Additional stars and further details TBA, but tickets are available online now for certain parts of the festival at http://www.surryarts.org. * Sept. 11 and 12: No need for an SOS. Everything will be O.K. at Tom Johnson's RV event in Marion, N.C., as long as D.B. the M.D. is there. * Oct. 12-17: A Cruise to Mayberry 4 is a 5-day version this year and it's sure to be another relaxing, fun time for all. Being on the cruise is a bit like sitting on Andy's front porch and watching the traffic on the road-only there's no road and no traffic, just the waves and a breeze. Visit the website for information and links to photos from previous Mayberry cruises. * Nov. 21: The "I Didn't Know You Stranged" chapter in Moundville, Ala., will hold a Mayberry in Moundville family social at the Moundville Church of the Nazarene gym at 6:00 p.m. Several music groups will be performing. Local Mayberry squad car replicas will be on hand as well as Mayberry tribute artists, including Kenneth "Otis Campbell" Junkin. 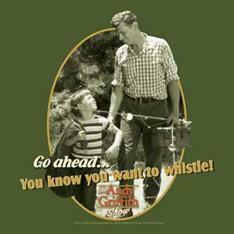 There will be whistling and trivia contests, episode watching, food, and who knows what-all. All proceeds will benefit the American Cancer Society's Relay for Life. More details TBA. Andy Griffith recently donated several more key original props from TAGS for friend Emmett Forrest's Andy Griffith Collection, currently housed at the Andy Griffith Playhouse in Mount Airy. You can see photos of these special items in the photo gallery section of the Surry Arts Council Web site at http://www.surryarts.org. And better yet, be sure check them out on display with the rest of this spectacular collection whenever you're in Mount Airy. "Waitin' on a Woman," the Brad Paisley song featuring Andy, has won another award, this time for Music Video of the Year by the Academy of Country Music. The award was announced just prior to the national telecast of the awards show on April 5. Angels & Demons, Ron Howard's current release as director, is having a very strong showing in theaters. It has topped the $100 million-dollar mark in U.S. ticket sales. Rance Howard, Ron ‘s dad, does another great turn playing a clergyman-this time as Cardinal Beck. Look for Clint Howard on duty (and conjuring feelings of déjà vu in another big summer film, Night at the Museum: Battle of the Smithsonian, now in theaters. It was a joy to see Jim Nabors back again at the Indy 500 to sing "Back Home in Indiana" as he has done most years for the more than three decades. George Lindsey is mulling an offer for a part in a movie as also awaits word on the future of a possible TV series for which he shot a pilot. Meanwhile, he's enjoying a restful spring since wrapping up another successful George Lindsey/UNA Film Festival in March. James Best is about to have a really busy summer. Along with getting in as much fishing as possible and working on various film productions with his Best Friend Films company, he has several big personal appearances this summer (see Floyd's calendar above). Michael Higgins died Nov. 5, 2008, in New York City of heart failure. He was 88. He played U.S. diplomat Mr. Clifford in "Barney Holds a Summit Meeting," Episode 240, and had a long and distinguished career in films and on the stage. He is survived by Elizabeth, his wife of 62 years, and three children. Wayne Heffley died Nov. 19, 2008, in Montrose, Calif., of kidney failure at age 81. He played Harry (definitely no cream puff) in "Howard's Main Event," Episode 225. 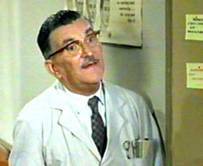 Among his many credits were a couple of episodes of "Gomer Pyle, U.S.M.C." and on episode of "Matlock." He excelled in the roles of tough guys and authority figures in a career spanning more than 50 years. June Vincent died on Nov. 20, 2008, in Aurora, Colo. She played The Actress in "Taylors in Hollywood," Episode 167. She also appeared in an episode of "Mayberry, R.F.D." and was a leading lady in films going back to the 1940s. That brings our total number of chapters founded to 1,342. If you're interested in starting a chapter of TAGSRWC, all you need to do is choose a name that hasn't already been picked, and submit it with a list of your founding members by U.S. mail. Here are some highlighted items. And browse the complete lineup of items at Weaver's Dept. Store at http://www.iMayberry.com. We have four brand new T-shirt designs in the Apparel Section of Weaver's. All are available in adult sizes Small to 2X-Large. They're $17 each and made of sturdy 100% preshrunk cotton. 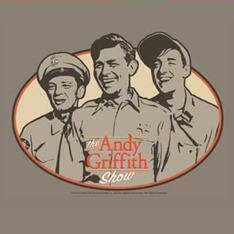 We think they add good fun to our lineup of licensed Mayberry T-shirts! The Apparel Section of Weaver's has sweatshirts, and more than 20 designs of T-shirts (most available in Adult sizes Medium through 2X, and several also available in Small). This oversized 320-page hardcover book (coffee-table style) is compiled by Steve Cox and Kevin Marhanka. Released last fall, the thoroughly researched book has lots of interviews with people who worked with Don Knotts, and it has more than 200 photos, including a 16-page section of color photos. This tribute to Mayberry, first published in hardcover in 2000 to celebrate the show's 40th Anniversary, is now available in paperback just in time to celebrate the show's 45th Anniversary in 2005. All 256 pages of content are the same, but have been scaled down in size a little bit, and the book has a paperback cover now. The price has been scaled down, too. The original coffee-table, hardcover version had a cover price of $35.00. This paperback version has a cover price of $20.00, but Weaver's has them for just $18.00. Enjoy tons of rare photos and insights from the cast and crew of TAGS, "Gomer Pyle, U.S.M.C.," and "Mayberry R.F.D." Ol' Ben Weaver heard that Stevens' Department Store over in Mount Pilot is accepting these three credit cards, so, following Bert Miller's gentle advice, Ben has grudgingly agreed to accept these for his customer's purchases, too. For the last eight months, www.iMayberry.com/podcasts has been the home of the Two Chairs No Waiting Internet Radio Show (podcast) hosted by Allan Newsome. 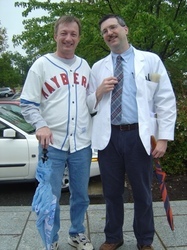 Mayberry Podders Kevin Burke and Allan Newsome at Mayberry Days in Mount Airy, N.C, last September. "He Pushed Me Real Hard. He Assaulted Me" chapter (St. Louis, Mo.) checked in to say that they still gather weekly for TAGS watching and other activities. They added, "The enjoyment of watching Mayberry episodes (and reading) is as important as it was in the early '60s on Monday nights!" To that we say, "Exactilioso!" Another Mayberry-themed podcast that we recommend you check out is hosted by Kevin Burke of our Thumbs in Pocket chapter (Johnson City, Tenn.). You'll find Kevin's podcast at www.burkeonmayberry.com. Kevin's angle is to provide info about each TAGS episode. He's working his way through the series in the order that the episodes originally aired. There were wedding bells in Barney chapter (Greensboro, N.C.) on May 29 when Amy Wolfford and Wayne Washburn were married by a local justice of the peace. (Well, O.K., they were actually married by a local magistrate, but we thought we'd "quainten" his official title up a bit.) Best wishes to the happy couple! 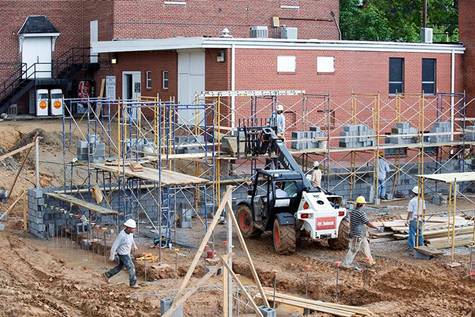 CHECK IT OUT--Can you spot the Goober in this photo? 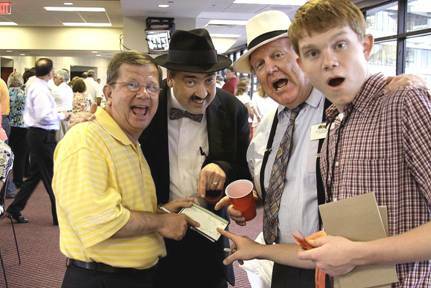 Well, let's see...there's Howard Sprague (Jeff Branch), Otis (Kenneth Junkin) and Opie (Jamie Sullivan). That leaves just old yeller himself, Mayor Doug Brewer, leader of Mayberry Minutemen chapter and organizer of July's Fifth Annual Mayberry Comes to Graysville festival, for the role of Goober. It seems to be a Goob fit indeed! All four of these fine Mayberry supporters were on hand, along with several TAGSRWC chapters and many others, for April's fundraiser for Eagles' Wings in Tuscaloosa, Ala. Photo by Alan Thornton. 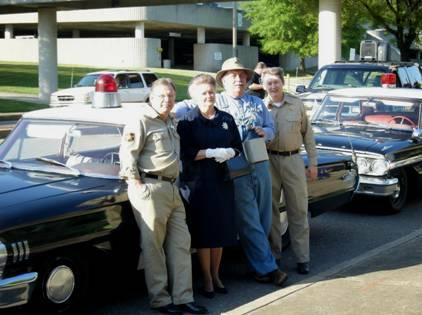 Among the members of Knoxville's Mayberry chapter participating with chapter squad cars in April's Dogwood Arts Festival parade were (l-r): Bill Branam, Georgia Branam, Bo Pierce and Dennis Beal. Miss Crump is back from her extended sabbatical to offer a new quiz. She hopes this test will be a fun and challenging one for all levels of Mayberry knowledge. 3. Identify a Mayberry resident who owns a set of golf clubs or is seen playing golf with a golf club. 4. Name six people who are described in Mayberry as having a headache (or head pain). BONUS: Name 15 different places outside of the continental United States that are mentioned in Mayberry. The deadline for entries to be e-mailed or postmarked is August 31, so you have the whole summer to work on this homework assignment. E-mail your answers to OldLadyCrump@iMayberry.com or mail them to TAGSRWC, 9 Music Square South, PMB 146, Nashville TN 37203-3211. Good luck! The next issue of The eBullet is scheduled for July, with a Weaver's Newsletter also planned for later this month.